There is always something utterly feminine about the moment of resistance when the zipper reaches the narrow part of the waist, that little jump as the teeth catch and it pops up to one’s shoulder blades, for at this moment there can be no doubt that you are now inside of the dress, there is absolutely nothing to stop the fabric from closing about your body completely. The sensation cannot last. It is but one in a series of raw, emotionally charged advances and retreats that tumble forth in the opening section, aptly named “Skirmishes,” of a memoir that crosses the complicated boundaries of what we can and cannot know about ourselves with honesty, dignity and grace. The Surrender, Scott Esposito’s searing account of his journey from his first furtive forays into his older sister’s closet to his ultimate celebration of the fluctuating equilibrium that best meets the balance between the masculine and feminine sides of his identity, takes the form of a triptych of interlinked essays. This format allows Esposito the ability to trace out a deeply personal quest without falling into the temptation to recast his story as a grand narrative project with a clear overarching trajectory. In real life, the end only appears to be the inevitable outcome of a series of circumstances and choices because that is how we justify who we are to ourselves and to others. But in the moment, as we stumble along from day to day, our experiences are fragmentary, contradictory, magical and, most of the time, mundane. Taken together as a whole, The Surrender turns from memoir, to film criticism, to literary essay. Throughout, Esposito is asking very honest, basic, human questions. Who am I? What am I? Where do these urges that have accompanied my existence for as long as I can remember come from? Should I try to bury them or give in to them? Is it even possible to ask that question? How far do I need to go to honour the whole of my being? The opening piece, the closest to conventional memoir, begins with the author’s description of his first long awaited and meticulous transformation, head to toe, to affect, no, to inhabit a completely female presentation. As the essay unfolds, we witness the progression of the exploratory ventures that have led to this important moment. The language is suffused with a palpable urgency. Here a child encounters the first unequivocal proof that not all human longing is pure. Here the first tentative descriptions of beings like himself are encountered, images tinged with deviancy. Relentless desire is ever more coupled with guilt and shame. Beautiful fabrics are coveted; purchases are made and discarded with the recurring hope that the urges can be overcome. And yet, in the process, the themes that will guide Esposito, in both the personal search and the attempt to construct a comprehensive narrative, are tentatively, sceptically laid out—threads to be pulled through to the end. I would never be the sort of person for whom self was a purely private matter. Whatever I wanted to be, I would not be it until I was at peace with it before the eyes of the world. This is the tension that underscores the entire work and pulls it together into one remarkable piece of memoir writing. It is this brazen act of bravery, more than any bold or anxious attempt to inhabit the dress and makings of a woman that drives The Surrender forward, giving it its power and continuity. It is not the compulsion to emerge from the “white tiled bathroom” of his earliest transgressions in an explicitly female item of clothing, or the validation of presenting “her” to a sympathetic friend, or any of the further explorations of the limits to which he can or must expose his feminine identity that signifies the truth of his experience. It is in the deliberate act of committing the story to paper and offering it to the scrutiny of others that true courage lies. A dress, a wig, make-up and heels are a mask, a costume, a fancy. To share the authentic self, to admit that the line between male and female is not defined, and to contend that both hold equal validity, is to stand naked and to refuse to feel shame. This account is neither apologetic nor self-indulgent, but it is real, and told with compassion, dignity and respect, for himself and for those he loves. The final essay, “The Surrender” fills in the missing spaces, but does not complete the puzzle, because, within the frame, the pieces are ever shifting. At this point the memoir takes on a literary element. This is the most intimate and intensely personal part of the journey. As he shares his experiences and honours his truth, Esposito gathers the reading that kept him company in the final years of self-discovery. He offers, in essence, a bibliography of his own process of coming to understand himself. This is a rich collection of resources, literary, critical and gender related for we are always, in the living, more than the sum of our parts. In the end we are left with a portrait of growth, evolution and self-recognition more nuanced and multi-dimensional than a simple “transgender memoir,” whatever that might be. It came to me one day that this must be it: to forget that deadlocked existence ever was. I can no longer return to captivity any more than I once might have leapt into freedom. It is only when we lose the capacity to remember who we once were that we can say we have truly changed. The story of gender exploration and discovery is never as neat or automatic as it may seem from the outside. Even when we tell our stories, as transgender people, there is an inclination to focus on the moments of self-recognition, those reflections of the self in the media, in literature, and in the world. As someone who has made a similar journey, albeit in the opposite direction and to a different end, Scott Esposito’s quest, his fears, his meditations, and even his willingness to embrace an internal dissonance, all resonate deeply with my own pained, awkward, and much delayed journey to find myself. It is rarely an easy road. There are many blind alleys, attempts to be “normal”, promises to the self, and tentative tests that can lead one astray. Most crucially, there is no one right answer, no absolute and ideal destination. The expression of the gendered self is a process, no matter the variables, but when you walk along the margins, when you feel that you are breaking a trail without clear signposts and directions, the pressure to give the process meaning, to label it and push it conform to an identifiable mold is almost irresistible. To surrender is the transgender equivalent of tightrope walking without a safety net. Yet it is the only way to truly find oneself. And, in the end, the truth of the story is in the living. The soul of the story is in the telling. Scott Esposito is the co-author of The End of Oulipo? (Zero Books, 2013) His writing has appeared in numerous venues, including Tin House, The Washington Post, Salon, the Times Literary Supplement, The White Review, The Point, Music & Literature, Drunken Boat, and elsewhere. He is editor in chief of The Quarterly Conversation, a senior editor to Two Lines, and a contributing editor to BOMB. In 2017 he will publish a book of creative nonfiction on film. The Surrender is published by Anomalous Press. 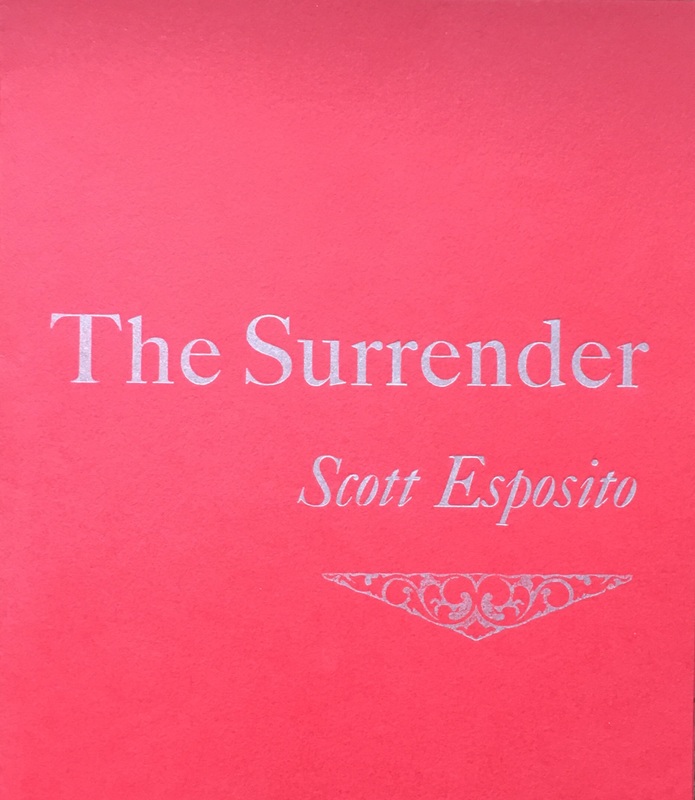 Posted in Book reviews and tagged gender exploration, scott esposito, the surrender. Bookmark the permalink.